Hunter-gather human ancestors start stone tool technology 2.4 millions years ago in central Africa with hammers and axes. By the time they migrate to Europe you see a specialization of tools and that become more refined. There Neanderthal man is eventually replaced by modern Homo Sapiens. 10,000 years ago in what is called the Neolithic age temporary stone circles become homes as man settles into villages and start to grow crops. That is the begining of civilization when an explosion of invention, tool improvement and advancement at an accelerated rate begins. Early development was excruciatingly slow but in the upper Paleolithic there was some kind of genetic mutation that triggered a change in the way we thought as Homo Sapiens, apes copy but don't teach kind of thing so this was very different. Carpenters arrive on the scene and develop quite amazing tools from flint that can work wood and immediatly figure out how to build homes so man can start farming. Once settled into villages man begins improving math to keep track of livestock and writing symbols in clay for bartering. Wood is one of mankind's oldest building materials. The ability to shape wood improved with technological advances from the stone age to the bronze age to the iron age. 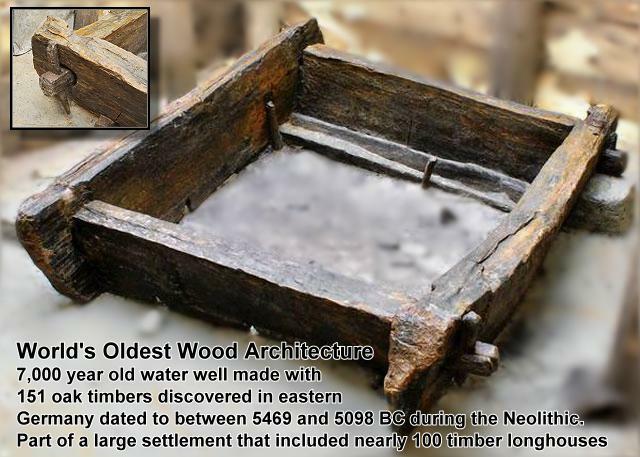 Some of the oldest archaeological evidence of carpentry are water well casings built using split oak timbers with mortise and tenon and notched corners excavated in eastern Germany dating from about 7,000 years ago in the early neolithic period. Oldowan tools are the oldest known 2.4 million years ago from Ethiopia made with a single blow of one rock against another to create an edge. 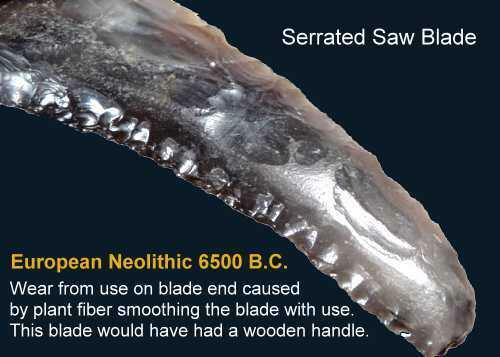 The innovation is the technique of chipping stones to create a chopping or cutting edge, our first knife, and Oldowan deposits include pieces of bone or horn showing scratch marks that indicate they were used as shovels. This shows we were finally able to select different rock like quartz and basalt to get the best flakes. Acheulean tools first appeared around 1.5 million years ago in East Central Africa, the inovation here is edges on both faces and shaping the entire stone then careful flaking and refining the edge with bone or antlers. About 1 million years ago we get the teardrop, lanceolate shapes, our first axe and milling trees for fire. By 500,000 years it reaches Europe. 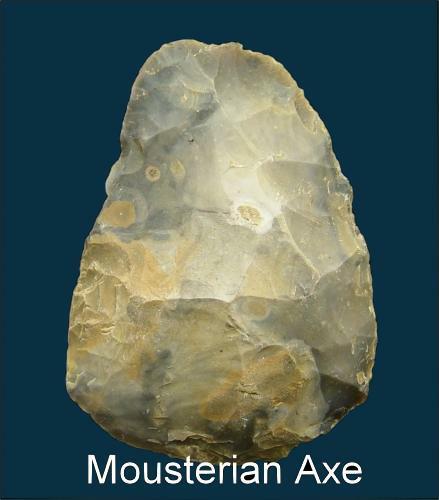 Analysis of the Mousterian stone blade technology 200,000 to 40,000 years ago show that many were used to work wood. The whole process of making tools had standardized into explicit stages a basic core stone, then a rough blank, before striking off wedge shaped flakes for a refined final tool. The process was more labor intensive, but the edges of the tools could be reshaped or sharpened as they dulled, so that each tool lasted longer. Upper Paleolithic from 40,000 to 12,000 years ago, now we have a wide range of specialized shapes even the development of ribbon-flint knives into saws by making their edges serrated. Elegant tool designs made possible by heating and suddenly cooling flint stones to shatter them in carefully controlled ways. In both periods some including a tang or stub at the base that allowed the point to be tied into the notched end of a stick for a handle. 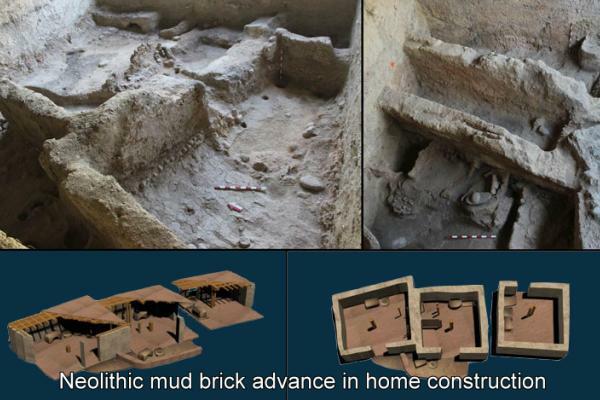 The first reliable traces of human dwellings, found from as early as 30,000 years ago, follow logical principles. There is often a circular or oval ring of stones, with evidence of local materials being used for a tent-like roof. The Neolithic (new stone age) 10,000 years ago that changed temporary stone circles by hunter-gatherers into homes began with the agricultural revolution similar to the Sumerians in Mesopotamia. The carpenters, usually the inhabitant, in that area made houses with same materials as those used there today. Mud brick, mud plaster and wooden doors with wood locks small wooden window frames with fretwork for light. The tools were polished not chipped except for specialty items. More advanced counting system emerges, writing and the development of the potters wheel. An average home in the fertile crescent were one room with most of their daily living spent outside. Generally there were no floors just hard packed earth. The roofs were made by laying beams from wall to wall a mat of reeds or thorn bushes with a coating of clay with a sand and pebble finish coat. A stone roller was used to make it smooth and able to shed rain. 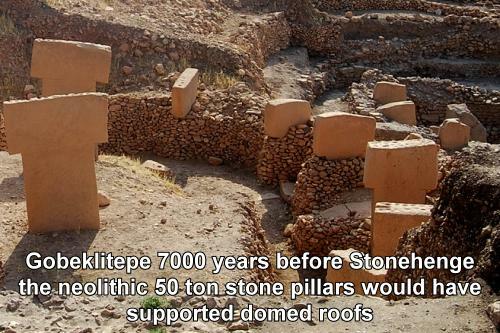 Archaeologist found rollers that were left on the roofs so they were maintained by re-rolling the gravel top coat. Neanderthal man was replaced by Homo sapiens and you should take into account that they were just as intelligent as us. They were dealing with a climate change where the ice caps went down into Southern Europe so survival not architecture would have been the focus. Also they evolved at different but similar rates geographically and exchanged technology, a good idea after all is still a good idea. So when you hear anthropologist talk proven specifics you also need to take into account that wood decayed and they surely would have had more advanced tools and homes made from easier to work with materials. Man has an oral history and with death always close at hand they began beliefs in gods that explained the events from before time, tribal traditions and bonds. There is a fascinating similaraty in those events. 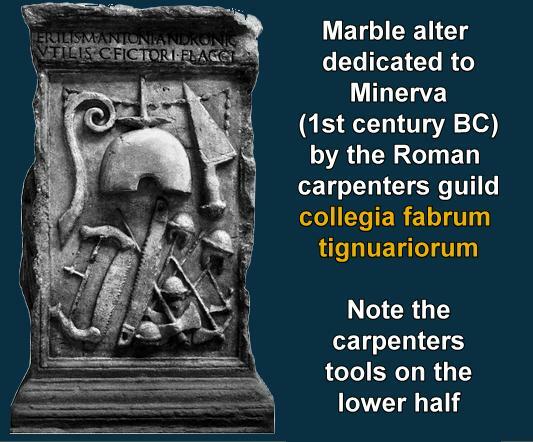 Some of the gods related to carpentry (crafts) were; Enki - Summaria, Ptah - Egypt, Athena - Greece, Minerva - Roman, Lugh - Celtic, Lu-Pan - China, Vishwakarma - India, Kulla - Babylon, Taoki-Ho-Oi-No-Kami - Japan, Belisama - Gaul, Dian Cecht - Irish, Kothar u Khasis - Canaan, Marunogere - New Guinea, Mushdamma - Mesopotamia, Nang Lha - Tibet, Solang - Micronesian, Xochiquetzal - Aztec, Hastsehogan - Navajo, Master-Carpenter of Haida Legend to name a few and with Chistianity you have Joseph as the Patron Saint of carpenters.